NEW Blog Design - excitement plus!!! 15% off! Another Sunday and I'm doing schoolwork! I can't believe how quickly Sunday comes around! Earlier today I had the best news! It's made my weekend actually!!!!! My NEW BLOG DESIGN is finished and uploaded! I am so excited can you tell at all?!?! 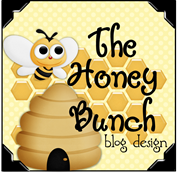 Erika and Misty at Honey Bunch Blog Designs have been so fabulous! For about the past month, they have been emailing me different ideas and really listening to what exactly I wanted - and it has come out perfect! What do you think? I owe a super big thank you to Erika and Misty, they have been so patient with me! I would definitely recommend them (both teachers themselves so even better), head on over to their blog to see more of their great designs! In other news, I have been working on finishing a few booklets at the moment, so of which I have been working on for a while. I look at my earlier booklets and think, WOW, I could do so much more with them now. 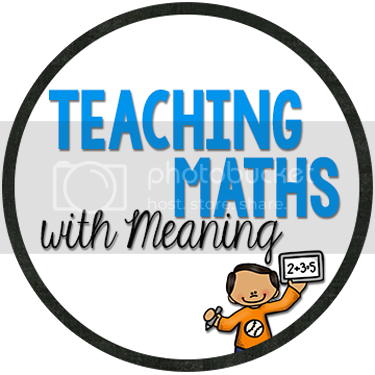 Adding my teaching resources to TpT has been an ongoing learning experience for me, and I am definitely getting more professional and precise with everything I do! I just want to go back and redo all those booklets again! If only I knew how to add more time to each day..... Does this happen to anyone else? 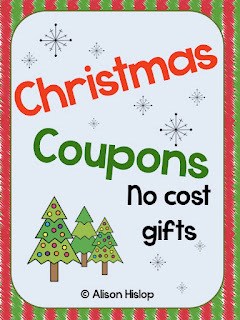 I loved the idea of creating a No Cost Gift for my children to give to their parents this year, so created these cute coupon covers and coupons. 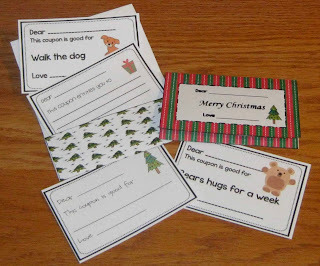 There is lots of variety in this pack to make it suitable for First Grade through to Third Grade. 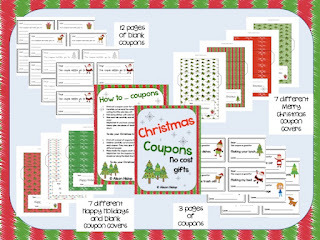 Some of the coupons have ideas already on them, some are left blank for children. Covers say both Merry Christmas, Happy Holidays and are blank. Click on the pictures to download! 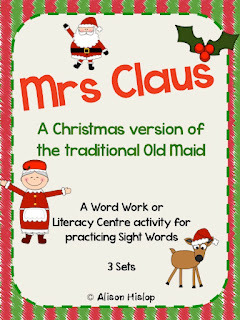 I have also put together a version of Old Maid, but using Mrs Claus as the card everyone is avoiding! 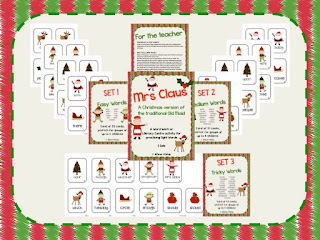 I have included 3 different word sets in this pack, so perfect for differentiation of student ability in your class. I would have used this when I taught First Grade and will be using the harder ones with my Third Grades during December! Click on the pictures to download. 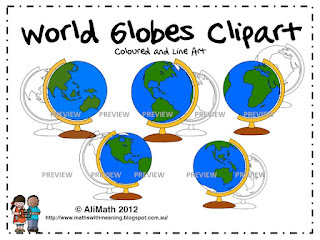 I have also uploaded two clipart sets. They are both perfectly computer drawn and very accurate. 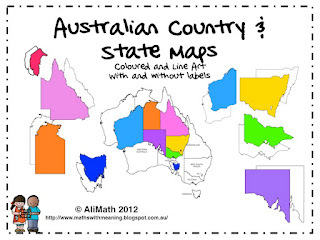 Living in Australia, sometimes I just want a globe that shows Australia! These globes have 3 different world views. When I am creating work for older children, I am very specific in wanting accurate and less "cartoony" style graphics so I thought these would be perfect! Click on the pictures to download. If you would like a freebie copy of one of these, please comment below and say which booklet you would like, include your email address, and on Wednesday 21st, I will put your names in a hat and email out one of each item! I am also having a 15% off sale on Monday and Tuesday of this week - followed by a huge sale next week, so make sure you pop by! Alison I love your new design! It is very you, well done. I feel the same way about TpT! Onward and upward. Thanks Tania! I am just sitting here looking at it! LOVE it! Very cute design! New Follower here! Thanks for visiting Shannon! I am on my way over to visit your blog now! The blog looks great! Very personal :) TPT has that effect doesn't it - makes me look a lot more critically at my practice. I love the new stuff but I would love is the globe art! I also love everything, but would really like the globes. The Mrs Claus set looks good! I love your new blog design! I like your Mrs. Claus set. Love new blog designs! Yours is so cute! Love your new blog!!!!! The math theme is so cute! Can't wait for the Sales! What about you? Fun Friday - We LOVED Maths today! Miss Galvin Learns - fabulous giveaway!